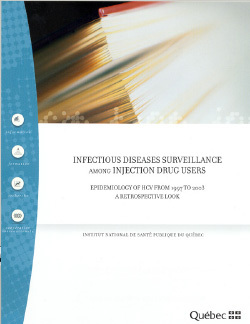 SurvUDI is a network for the epidemiological surveillance of human immunodeficiency virus infection among injection drug users. The network was established in 1995, and covers eight districts in Québec, and Ottawa. Individuals who participate report injecting drugs during the six preceding months and are recruited mainly through centres that provide access to sterile injection equipment. A two-part study on hepatitis C (HCV) was appended to the SurvUDI network. This report presents the results of the epidemiological component; the psychosocial component will be discussed in a subsequent report.